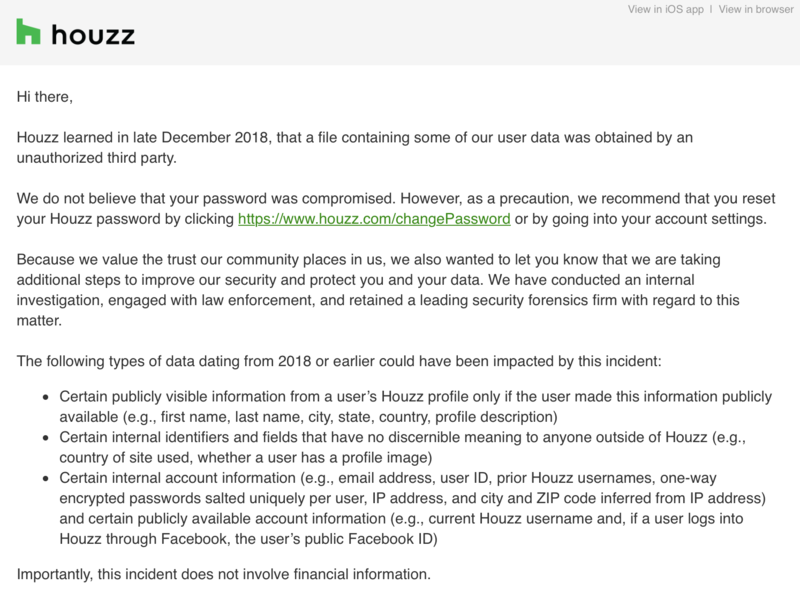 In what may be the first large data breach of 2019, Houzz just issued emails to their customers about a data breach that occurred in their systems in December of 2018. I happened to be affected by this matter and felt it would be beneficial to my followers to share the news as well. I’ll continue to update this post as the situation develops, however, a breach of this scale once again reinforces the fact that everyone should be using unique and secure passwords across all of their networks and services. For those who are prone to losing their passwords or don’t want to write them down, a password management tool like 1Password offers convenience and security for a low monthly price. 1Password pricing starts as low as just $2.99 for a personal account or $4.99 for a family account. If you’ve received this notice from Houzz, be sure to reset your password at your earliest convenience to keep your information safe!